TO THE GRAND LODGE I.O.O.F. 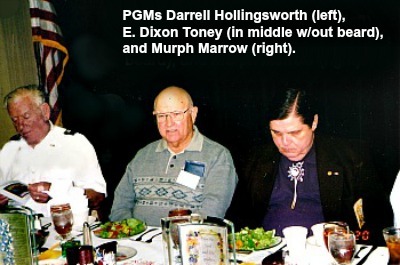 OF TEXAS: March 17, 1998 was a day which began a new era in the newly elected Grand Master for the State of Texas Odd Fellowship for this person. It was a day which began with a lot of concentration of how will this year end. First, it was with lots of soul searching and anxiousness to do the very best possible for the great fraternity of Odd Fellowship. Second, how to accomplish this also was on the mind of the Grand Master who had been chosen to serve the lodges this year. Third, can this be a year of growth and fraternalism for Odd Fellowship in this great fraternity. These are some of the beginning thoughts which entered my mind. 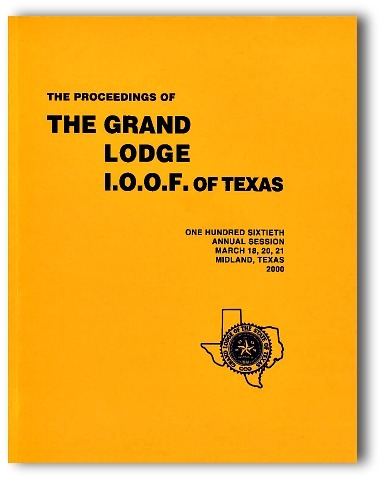 I would as Grand Master like to say thank you to the lodges of Texas who have been so gracious to me this year Without your effort, this year would have been less productive. 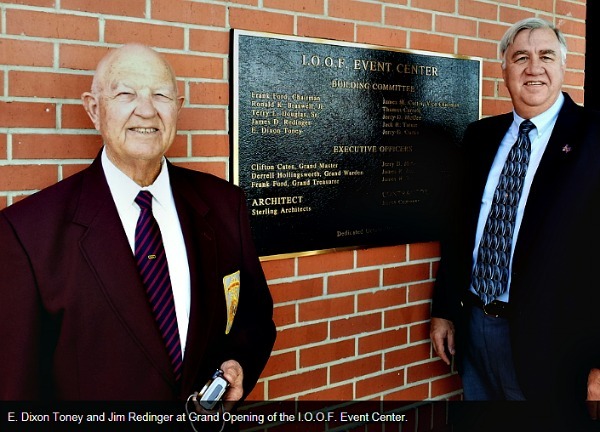 The lodges in Texas can point with pride toward themselves as a whole in the many new Odd Fellows that have joined our ranks. There were several who led the way this year. It is notable to mention two lodges in the same breath for they have been our leaders in new members. Alphabetically, Farmersville and Smithville have been the leaders this year. It makes a person wonder if "ville" has anything to do with the way they accomplish things. Perhaps each town with a lodge should add "ville" to the end of their names. Just kidding, but wouldn't it be great for every lodge to have the increase they have had? It is not to say that many lodges have worked hard and it will pay off in the years to come. To the lodges who didn't have a spectacular year, keep at the task for you could be next. With your indulgence, I would like to say thank you to those who helped install this Grand Master and those who helped. To Charles Roberts, Rabon Moore, Tim Schuster, Hank Henry, and Howard Holmes, who conducted the functions and served as Marshals, my hat is off to you. To the District Deputy Grand Masters who served so long and arduous, "thank you" for all you did in your districts to help this Grand Master. To the Lodge Deputies who did their best for not only their lodge but the Fraternity as a whole, "thank you". This Grand Master would like to thank those lodges in particular who held Degree Rallies in their lodges. I want to thank the two designated lodges at the beginning of the year, William Tell No. 27 in Tyler and Ft. Worth Lodge No. 251. Many other lodges have had rallies and they are deeply appreciated. It is a time of fellowship and fun and I would recommend that a lodge might think about volunteering to hold a rally in the future. I would like to thank the lodges in Waco, both Rebekah and Odd Fellow, for the reception held for this Grand Master and for the many who worked and those who attended to make this time so memorable during this year. It has been an honor to serve with Marie Moseley, President of the Rebekah Assembly this year. I want to thank all of the Rebekah sisters for their concerns and for prayers this year. The enjoyment which each of us receive as we all work together is to be commended as our lodges forge forward. Hopefully we have made a difference this year in our communities in which we have lodges, both Odd Fellow and Rebekah. To the Grand Lodge staff which has been so helpful to this Grand Master. Without these fine people to aid the Grand Lodge, we would find it, difficult to accomplish all the things this Grand Lodge is about. Nancy, thank you for assisting me in the many letters and reports that you have handled. Darline, for letting me know when I made an error in my vouchers and accounts. Thanks for keeping my path and for the reports. Jim, "under", thanks for keeping me abreast of the things I need to do and for taking care of my "caps" that I leave. To Jack, I can't express all my thanks to you for giving good words of wisdom as well as hearing all the complaints that have come to the Grand Lodge this year. My brothers, we are well served by the Grand Lodge staff and I personally want to thank each of you for your hard work. To the Directors of our Homes, Dorothy Harkins and Jane Tucker, it has been my pleasure to serve with you this year. It is my hope that the residents of our homes know their good fortune to have people who care and so patiently serve. The Boards of our Home and Trustees of the Grand Lodge, it is with admiration that I commend you for the work you accomplish. Ray Parrish, who has served this year as Chairman, thanks for all you have done. This is not an easy task for anyone so thanks for the effort. To all who served and looked after the interest of the Grand Lodge, I say thank you. Waco Lodge No. 137, thank you for letting this Grand Master miss so many functions in our lodge. I want to thank this lodge for helping me during the time I have been privileged to serve. I truly am looking forward to returning and sharing the work. Not only to Waco No. 137 but to all of the lodges who served food and refreshments, I want to thank each of you. The hand of fellowship means so much to all the Grand Lodge officers. Last but not least, I want to thank my wife, Cordie, who put up with long hours of being by herself. The endurance of any wife of a Grand Master is truly tried. The nights when this Grand Master was away and hearing the joys of what lodges are doing made her task a little easier when I returned. To this Grand Lady of my life, I owe a deep debt of gratitude. Summing all this year up has not been easy for I know I left many important people out. Remember everyone is important and we walk on the same level as everyone else in this world. For everything each of you have accomplished this year, I take my hat off to you. It is in Friendship, Love, and Truth, I say "Remember who you are". TO THE GRAND LODGE I.O.O.F. 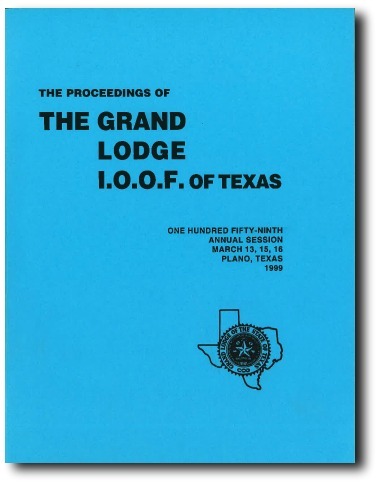 OF TEXAS: March of 1999 was a new way of life as I began a second year as Grand Master of Odd Fellowship in Texas. This Grand Master wants to thank this Grand Lodge for the opportunity to serve in this position. It is a great honor to serve this fraternity. This fraternity has so much to offer to a community so let us keep Odd Fellowship before the people. This Grand Master wants to thank the many lodges in our state for the warm receptions they have given to me. Without the lodges and its members there would not be a need for leadership. The members are the most important people of our fraternity. We as Grand Lodge officers want to extend our best wishes for the future. The enthusiasm that has been evident this year is tremendous. Many of our lodges have had increases in membership, some have held their own while some have lost members. We have had three degree rallies in the state this year. These rallies were held at William Tell Lodge No. 27 in Tyler; Ft. Worth Lodge No. 251; and Fred Ende Lodge No. 87 in Greenville will have one before the Grand Lodge session. I thank each of these lodges for holding these rallies and the good response we had. Ennis Lodge No. 227 has been a lodge which I want to thank for doing so many degrees for various lodges. They have been a tremendous help to this Grand Master. Our Degree Team Captain, Brother Charles Roberts, has done an outstanding job in getting teams lined up to help in these rallies as well as setting up degrees when called upon. Brother Charles has driven a good number of miles, as well as Brother Howard Holmes, to be at rallies. This Grand Master was present at the laying of the wreath at the Tomb of the Unknown Soldier in Washington, D.C. It was an outstanding service with our Sovereign Grand Master, Brother Connie Mac Riley, leading the parade. It was also my privilege to attend the Sovereign Grand Lodge at Seattle and watch the many committees that work long hours. The Deputy Grand Master, Brother Eugene Head, has done a yeoman's job this year for this fraternity. Brother Head is to be commended for the many miles and hours devoted to improve our fraternity. Every time I look up Brother Head is there and I want to thank him publicly for the fine work. Brother Head will be a great Grand Master with our help. We realize no one person can succeed, but all working together we can. Let us support Brother Head as a fraternity and to Ann, thanks for sharing him. To our Grand Warden, Bill Guy, thanks for traveling with me a great deal this year. You have been a great help to me, especially when I could sit and relax while you put many miles behind us. For these p]aces you had not been, it was a great experience for me to share them. To the heads of other units, I want to say thank you for inviting me to your sessions. All of us are part of a great fraternity, so let's keep working together to be successful. Brother Jack Tatum, our Grand Secretary, and his staff have made this year an enjoyable one. Nancy Chew has been a large part of my right arm this year and I am indebted to her for her hard work. Darline has kept me on an even keel when I didn't get reports in and I want to thank her. Brother Jim has always answered my questions about various things. He, also with Nancy, helped us keep the Odd Fellow News items so we could put together the paper. Brother Jack has been a wealth of information on making deadlines, setting dates, helping organize Grand Lodge, seeing that reports are ready, and many other things. Brother Jack, thank you from the bottom of my heart for all of your assistance. The Board of Trustees have worked hard this year and I want to take this opportunity to say thanks for your long hours. We realize that it is a thankless job many times but you are needed in our fraternity, so thanks again. We have closed some lodges this year and that is never a pleasant task. This leaves a void in the towns where these lodges were located. Not only did the town lose, but we in our fraternity suffered a greater loss. This Grand Master hopes in the coming years we will be opening lodges instead of closing them. It can be accomplished for our predecessors did. The task will be up to all of us. To my home lodge, Waco No. 137, and its members for allowing me the opportunity and their support in our endeavors - Thank you! Last, but not least, I want to thank my wonderful wife, Cordie, for the many hours she allowed me to do this. It has been a time of anxiety on her part while I was traveling. She has been a warrior this year to combat some health problems but has remained an inspiration for me. Without her love and prayers, it would have been a difficult year for both of us. Thanks Cordie for your love and support this year. In closing, I want to leave a challenge to the members of our fraternity. If each of you will get a member each year for the next three years, we will be well over 10,000 members when the Grand Lodge session begins in 2003. Think about the excitement this would bring. Let's do it!